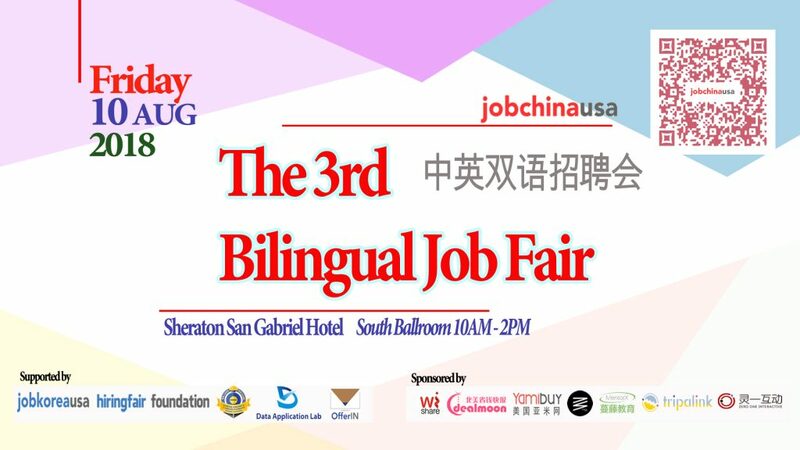 JobChinaUSA 3nd Bilingual Job Fair will be held on Friday, August 10th, 2018 from 10AM – 2PM at the Sheraton San Gabriel Hotel in the South Ballroom. This job fair will showcase different companies of various job industries with multiple positions. It is being supported by Job Korea USA, Hiringfair Foundation, North American Career Express Association, Data Application Lab, and OfferIN. Our various promotional sponsors include: WiShare Media Group, Dealmoon, Yamibuy, Tripalink, 01 Interactive, and VantaBlack Studio. 在美国营养保健品蓬勃发展的庞大市场中, 各家兵马竞争也相对激烈, 而4Excelsior, 营养保健品制造代工商, 坐落于橙县Anaheim, 不仅掌握各方交通要道, 也同时握有了最新技术及资讯情报,让公司仅短短成立三年, 就已经崭露头角, 逐渐占有市场主导权. Welcome to Air China, the exclusive national carrier for China and one of the world’s largest airlines with a robust route network that spans six continents. A Star Alliance member, Air China operates over 200 weekly flights to 13 destinations in the Americas, including New York, Newark (New Jersey), Washington, D.C.; Los Angeles, San Francisco, San Jose, Houston, Hawaii, Vancouver, Montreal, Havana, Panama City and Sao Paolo from our hubs in Beijing, Shanghai and Shenzhen. Airsoft Megastore is dedicated to providing our customers with the latest and best in Airsoft sporting goods and Outdoor equipment. Our mission is to provide unparalleled customer experience and include the masses within our network of outdoor sporting goods and recreational products. Central Health is a health insurance company whose goal is to provide excellent care to the Asian community. We were first formed in 1999 by a group of physicians who saw some missing elements when working with other insurance companies, and wanted to form Central Health to provide a service that fills in those missing pieces. Our vision is to provide the best possible service to the physicians and members of the Asian Community in the San Gabriel Valley. We later expanded and formed Central Health Medicare Plan of CA in 2003 and received our Medicare license in 2004 along with our Knox-Keene License. 中国东方航空集团有限公司总部位于上海，是我国三大国有骨干航空运输集团之一。借助天合联盟，东航构建起以上海为核心枢纽、通达全球177个国家1074个目的地的航线网络，年旅客运输量超过1.1亿人，位列全球第七。Headquartered in Shanghai, China Eastern Air Holding Co. Ltd (CEAH) is one of the three major air transportation groups in China. As a member of the SkyTeam Airline Alliance, CEA extended its flight network from its core hub Shanghai to 1074 cities in 177countries worldwide. It serves over 110 million travelers annually and ranks 7th globally in passenger volume. This is the best opportunity to join China Southern Airlines in the North America Region. We are a proud member of Sky Team and operate the largest fleet, most developed route network in the world. Currently, the airline fleet is ranked the first in Asia and the fifth in the world. And we are the first airline in the world to operate both A380 and B787.If you would like to explore working in a fast paced and friendly environment, we’d love to hear from you. As a state of California agency, we assist people with disabilities and barriers to employment to start or return to work. Every Industry devotes to providing customers with unique lighting design and leading optical applications, always strives to build home full house lighting solutions to create a comfortable, healthy and extraordinary taste of the light environment, our purpose is making life simple, enjoyable and more fun. Farmers Insurance was established in 1928 and is the 2nd largest personal line insurance company serving California. We offer a full line of products from auto, home, life, commercial insurance to financial services. We have an unwavering commitment to uphold our founding ideals to provide industry-leading products and first-rate services to the customers we’re privileged to serve. Please contact us if you want to have a career with a future. Gibson is the nation’ s leading producer of dinnerware, flatware, cookware, glassware, coffee and tea accessories, kitchen tools and gadgets, and other tabletop and housewares products. Through its family of national brands and private label collections, Gibson provides customized programs to the world’s largest retailers in every class of trade. We offer product development and creative design expertise, sourcing based on decades of experience, production management and industry-leading quality control. Gibson is your dedicated manufacturing partner every step of the way – going above and beyond to generate success for our customers. Hiossen is one of the largest dental implant manufacturers and sellers in the world through our dedication to developing innovative, safe, high-quality and effective dental implants. We have 23 sales offices across the United States and we currently looking to expand and grow our operations, therefore we are looking for motivated and enthusiastic people to join our team. Hiossen offers a comparable salary and commission plan, auto allowance, gas card, phone reimbursement and a full employee benefit program with great coverage and low cost. If this sounds interesting and you would like to be considered in moving forward, please apply now! Resort lifestyle apparel brand for Men and Women. Based in Shaoxing China, we also operate a USA merchandising and design office in Irvine. With worldwide distribution built over the last 20 years, we are currently focusing on building the Brand in the USA. Oooh Yeah Socks! are crafted using the finest combed cotton to create iconic designs that represent every lifestyle. After a decade of worldwide experience in the sock world, we decided it was time to launch a sock line that would not only feel great but covey every individuals personality. We take pride in our brand and designs that range from nostalgic fun graphics to heritage pride. We are the wealth management resource for over 13,500 individuals, families and businesses1 located in California. Our management team has over 250 combined years of industry experience and is joined in serving you by professionals who have earned advanced designations including nine Charter Life underwriters, ten Chartered Financial Consultants through The American College and three Special Care Planners who can help you develop future plans for a person with a disability or other special needs. New York Life’s promise? To work with you to build a strong financial future. We have always believed in helping people like you, families like yours, and businesses of all kinds create, protect, and preserve their financial security. Since 1845, we’ve been doing just that—making sure our customers are prepared for whatever life has in store and that we will be there to help them face the future with confidence. We’re a lot like the clients we serve. Each of us is working hard to meet life’s responsibilities and build our own futures. Funding retirement? Looking after aging parents? Dealing with the death of a family member? We’ve been there, and we’ve persevered through the toughest of times. So when we work with you, we appreciate that we are being trusted with your most important assets: your family and your business. We take that responsibility seriously. For more than 170 years, we’ve kept every promise we’ve made to our customers. That’s simply a fact. Pac-Dent, Inc. offers the highest quality of dental products on the market today. Since 1992, we have provided superior services and products to our customers and have assisted them in achieving their goals. Our continual commitment to excellence has earned us the reputation as one of the best dental product manufacturers and wholesale dealers in the area. Pacific Bridge Packaging is a stable and growing company, specializing in importing custom manufactured goods and packaging from overseas factories for medium to large size US companies. We have a sales and customer service headquarter in Pomona, CA and a manufacturing and sourcing office in Dongguan, China. We have presence in many industries, from beauty to automotive to industrial products. We are always seeking talented and motivated individuals to join our fast-growing company. We offer competitive salaries and generous commission structures,, full medical benefits, and paid vacations. StemCyte is a leading Regenerative Cell Therapy (RCT) company focusing on Stem Cell Transplantation and Regenerative Medicine derived from the world’s largest and most genetically diverse donor cord blood stem cell bank. StemCyte offers public and private newborn cord blood stem cell banking. StemCyte has released 2100+ cord blood units, which are more than any other private cord blood banks combined, to more than 315 transplant centers worldwide. StemCyte operates internationally in the US, Taiwan and India. The headquarter is in Baldwin Park, California. Taos Global Group is a professional comprehensive financial services firm, which comprises of Taos Insurance Agency, TZG Accounting LLC and Taos Investment Advisors LLC. We are looking for professionals who can apply his/her knowledge to provide outstanding customer service to all our clients. We look forward to your participation! 桃源集团是由桃源保险，桃源会计和桃源投资组成的一个综合性金融服务集团。我们正在寻找愿意用自己的专业知识服务客户，以客户至上为服务理念的人才，我们期待你的加入! Since its establishment in 1964, JTB USA, Inc., a US subsidiary of JTB Corp., has grown from a travel information service bureau for Japanese travelers to the US to a full-service travel management company meeting the needs of all travelers. Today, with access to a worldwide network of affiliates, JTB USA provides global travel management services for business and leisure travelers in the US markets. Travelers appreciate JTB USA’s superior service capabilities in all areas of the world. Since being founded in 1775, U.S. Army is made up of the most dedicated, most respected Soldiers in the world. These Soldiers protect America’s freedoms while serving at home and abroad, and they are always prepared to defend the Nation in times of need. U.S. Bancorp, with 74,000 employees and $460 billion in assets as of March 31, 2018, is the parent company of U.S. Bank, the fifth-largest bank in the United States. The Minneapolis-based bank blends its branch and ATM network with mobile and online tools that allow customers to bank how, when and where they prefer. 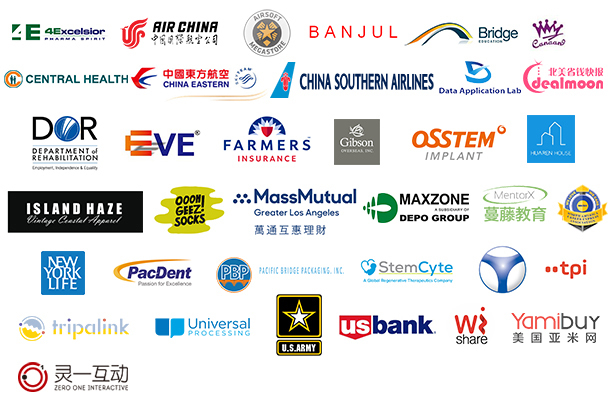 U.S. Bank is committed to serving its millions of retail, business, wealth management, payment, commercial and corporate, and investment services customers across the country and around the world as a trusted financial partner, a commitment recognized by the Ethisphere Institute naming the bank a 2018 World’s Most Ethical Company.